“Your star mother, Arrakis, dances with your soul on the celestial inner planes. She dances in the embrace of Father Sky, shining white and pale, deep in devotion to the light behind all that is. Arrakis, Dancing Star of the Heavens, incites our souls to feel the rhythm of life and surrender to it in flow, in grace, stumbling and in play. Like a child who thinks not of the ‘right steps’ but just moves with music and with joy, she reminds you to dance freely and from your heart. She reminds you that your soul is constantly dancing with the Divine. What better way to connect with the joy and beauty of your soul than to mimic its movements? So dance, beloved. Let your being dance. Oh Arrakis! Your bright beauty penetrates even the darkest of minds to remember, remember, remember. Then she descends! Like a torrential downpour of devotional light, a tsunami of affection is unleashed. A rampaging cosmic tigress hurtles towards you, her claws gripping the fabric of the skies as she rushes to protect her beloved cub. She will fight for you against the forces that would dull you and dumb you down, obscure your brilliance and stultify your free form dance into strict, choreographed movements. She will pour her luminous essence into every crevice of your demanding soul. Nothing can resist her light. All shall be washed and revived in the outpouring of her luminous love. Then, sated and content, you are the child so secure in the love of the mother, you trust in life implicitly and in what is brought to your door. You do not succumb to untruths. You do not resist because you are safe, held in the love of the mother. You have no need to resist. What is there to resist? Nothing! There is only the loving truth in your world and all is at peace in your heart. And should there be cause to stand up and fight – for love, for freedom, for light, for her truths of unconditional life, respected and honoured – well, you shall particularly equipped for success. When there is that war to fight, you shall be the warrior who defends the motherland, absolute in your devotion to her ways and empowered through her vast, indefatigable, triumphant power. And shall you bludgeon your way with brute force and fear? Of course not. So here is your guidance. Lay down your old weapons for new technology awaits you! It is the most magnificent of forces, that of divine alignment, of surrender to the Star Mother and her way of luminous potency. From her great vantage point, the vastest problems of our earthly mindsets are merely in need of a quick whipping by the tail of a comet, and this she easily achieves by flicking a strand of her hair or poking out her tongue. In the hands of a greater being, even your deepest trials will succumb to divine victory. Your ability to take the journey will be strengthened, and your success only a matter of the passing of time. Can you give yourself this gift, this blessing of the love, power and protection of your star heritage? 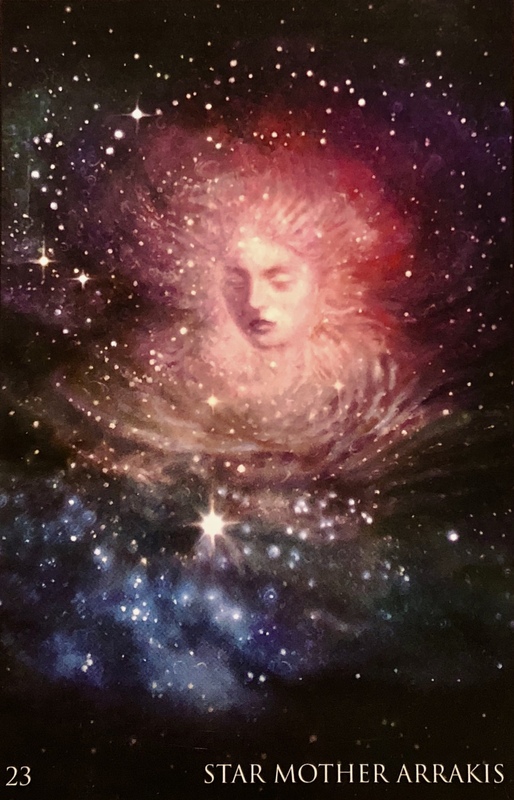 We all descend from the stars, but some of us are asked to remember to acknowledge the divine parentage from which we come, and to allow the innate divine dignity within to restore us to faith in the path here on earth. There is no living a full life without dedication to complete authenticity. If we are still living in illusion, if we are still living a lie, then we will pay the price by not getting to live life fully. We will always feel stagnant. Something will always be missing. There will always be an excruciating longing, a pulling, a whispering of the Soul. If we live behind our masks in fear, then fear we will have. If we are not standing in our power, then we will feel powerless. If we keep using bandaids to cover up the wounds instead of delving deeply into the abyss to heal, then we will keep living the same patterns over and over again. Maybe in this lifetime; maybe over many lifetimes. This is an invitation to step into our full authentic selves. Unapologetically be who we are. Step boldly onto our life path. Despite the fear of failure or judgment or rejection. Despite what others may or may not think. Having absolute faith in the process, in the support and connection to the Universe. Knowing that we came here to do just this. Remembering. Waking up and taking full responsibility. Knowing that we are always guided, always loved. Knowing that we are absolutely celebrated for who we are, and how we fit into the collective. Step out of the box you have been stuck in for far too long. And embrace all that life has to offer you. Find joy in creating something new.